Brian Kelley is a seasoned communications professional with experience in public relations/public affairs, writing, editing, media relations, social media and Web design based in the central New Jersey area. In addition to his professional experiences, Brian has ventured into social media as co-host of the Technology and the Arts webcast/podcast and as creator/host of his own open-format, interview-based podcast called Tandem With The Random. 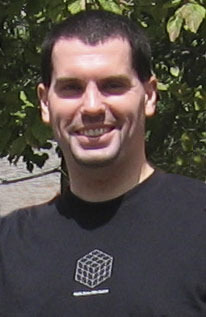 Brian, who dabbled in comic book-style art in his younger years, was one of two keyboardists in a synthesizer/sampler-based rap group active in the late 1980s and early 1990s. He left the band in 1991 and, except for a few creative bursts later in the 90s, didn’t return to music until 2004. That was when Apple released the first version of its consumer-level music recording application, GarageBand. Upon purchasing GarageBand and a new Alesis QS6.1 synthesizer to act as a MIDI controller, Brian quickly revisited his musical past by creating modern recordings of songs he had written in his late teens. The writing and recording of new songs soon followed. Around the same time GarageBand entered his life, Brian also became more involved in blogging, enjoying the freedom of writing whatever he thought about and sharing it with the world. This led Brian to ponder the impact technology was having on his personal creative processes—and on the arts in general. Those thoughts evolved into the concept at the heart of the original Technology and the Arts podcast, which debuted in December 2006. Brian continues to dabble in songwriting and, from time to time, posts “works in progress” on his Soundcloud page. Since 2008, he has also played keyboards, accordion and various percussion for his longtime friend, singer-songwriter Christian Beach (the other keyboard player in the long-defunct techno-rap group) both in the studio and on stage. Born in Edison, N.J., Brian grew up in Brick Township, N.J. After receiving his associate’s degree in print and broadcast journalism from Ocean County College in Toms River, N.J., he continued his education at Rider University, where he received a bachelor’s degree in journalism (public relations) in 1997. Brian—a huge Doctor Who and Philadelphia sports fan—lives in Mercer County, N.J., with his wife and young son.